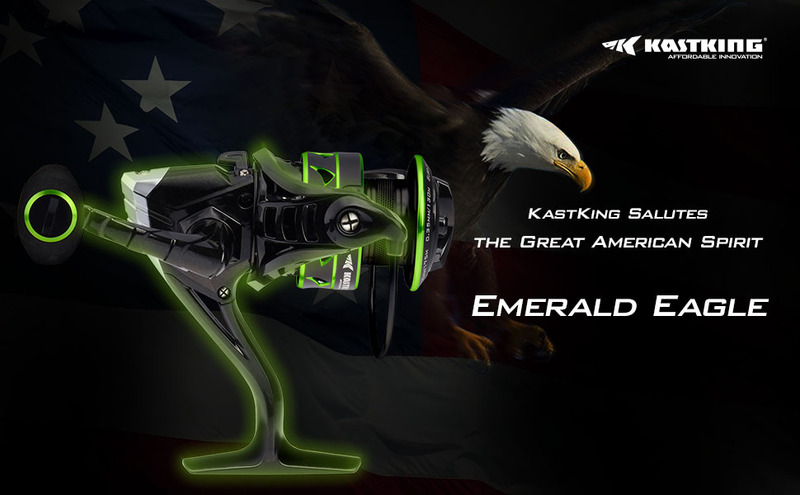 EMERALD EAGLE ADDITION – The new dynamic KastKing Emerald Eagle is part of the KastKing series of Valiant Eagle spinning reels. This edition with dazzling green trim reflects with the brilliance of precious emerald stones and the green of the saltwater seas, where this eagle fishing reel feels right at home. Like an eagle, the Emerald Eagle reel is built for power and speed as a freshwater or saltwater spinning reel. LIGHT, FAST, STRONG - KastKing Valiant Eagle fishing reels convey speed, power, relentless pursuit and fearless spirit in the hunt. The Emerald Eagle edition honors America’s symbol by providing an amazing fast speed 6.2:1 gear ratio, raptor inspired lightweight yet strong body with an enhanced graphite frame and rotor, and the incredible power of an exceptional 22 LB multi-disc carbon fiber drag. SUPER PERFORMANCE – The sealed carbon drag system provides 22 LB of fighting power and keeps drag washers dry to avoid inconsistent drag operation. This super smooth drag is powerful enough for fishing adventures going after large fish but starts smoothly to protect light fishing lines. For consistent performance in both fresh and saltwater fishing conditions KastKing uses a total of 10+1 shielded stainless steel ball bearings for remarkably smooth retrieves and long accurate casts. BREAKTHROUGH TECHNOLOGY - KastKing’s world class engineering team is dedicated to providing you with affordable innovation. KastKing has utilized their amazing patent-pending E.P.S. (Expanded Pinion System) and S.S.R. (Sliding Stabilizer Rod) into a spinning fishing reel priced under $100. Stabilizing the pinion gear and main gear increases the gear strength and durability. It offers you more performance and consistent operation than much higher priced fishing reels. 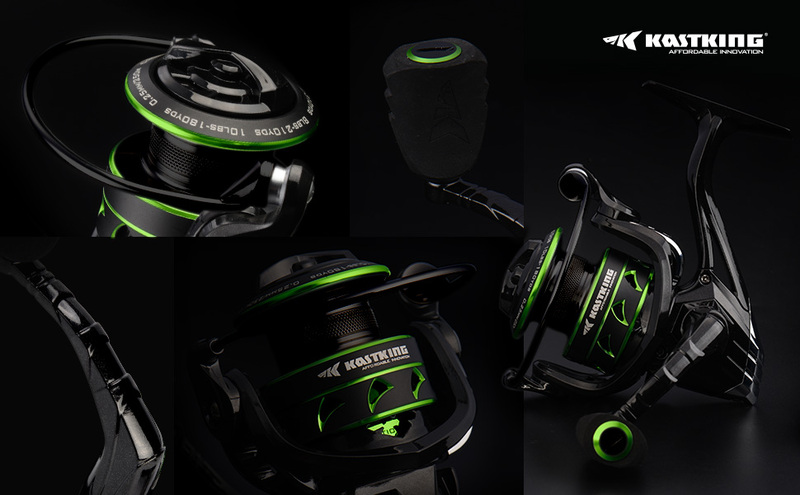 UNIQUE FEATURES– The KastKing Emerald Eagle fishing reel has a Patent Pending spool design to increase casting distance and improve line control. Plus, its braid line-ready spool doesn’t need monofilament line backing before filling the reel with braided line to avoid slippage. The lightweight aluminum handle with EVA knob provides you with extra leverage and control. Emerald Eagle is great for bass fishing, kayak fishing, inshore saltwater fishing, or as a catfish spinning reel. Just as the Bald Eagle is a symbol of American freedom and strength, the new Valiant Eagle spinning reel is a symbol of quality, innovation and affordability for KastKing. New among KastKing Spinning Reels the introduction of this feature rich fishing reel is sure to please anglers from coast to coast for freshwater and saltwater fishing. Emerald Eagle Edition uses an enhanced graphite frame and rotor for strength and durability. Along with total of 11 (10+1) stainless steel ball bearings, the Emerald Eagle Spinning Reels provide outstanding smooth operation and consistent performance. The spool is CNC machined from aircraft aluminum and anodized for appearance and high performance. It also features KastKing’s Patent Pending line management system for consistently long casts. This is the perfect reel for both fresh and saltwater applications. The aluminum spool features a sealed carbon drag system that is waterproof and keeps the carbon drag washers dry to deliver consistent, smooth and powerful drag pressure to handle strong fish. KastKing knows that a comfortable handle is a vital component in great spinning reels. We’ve included a tough aluminum handle with a lightweight EVA handle knob that is super comfortable even after hours on the water and gives the angler the extra leverage that is required to have complete control for fighting and landing fish in all weather conditions. Amazing reel for the price! Amazing looking reel with a butter smooth feel. Haven’t used it yet, but I’m pumped to use it salmon fishing later this spring! This review will come in two parts, because it will be a few days before I can actually fish with this reel.I must say that my initial impressions are very favorable. Just the sound of the bail action is a statement of quality. This reel feels very durable, cranks like silk, and from hand tests of its robust carbon drag system, I could not detect any dead spots.You've heard it before but I will say it again anyway: the components in this reel are top shelf. This seems to be an amazing light tackle reel (my use for it anyway) for the price. This has become my second favorite reel. Also bought the 5'-6" KastKing Calamus Rod for my ultra light setup, makes a perfect combo!! KastKing is good. Always kast king all the way. For the money it is the best in the market. Smoothest reel I've owned.